Economics: Principles & Practices is the only program with full coverage of the new economy and the impact of the digital revolution. It is correlated to the National Standards and, in addition to having current statistics and news events, this program has updated diagrams, charts, maps, photos, and illustrations. Connect economic concepts to real life with Case Studies and People features that make the study of economics fun, relevant, and interesting. Careers features include updated job titles and salary information. Select appropriate teaching tools at the point of instruction with the Teacher Wraparound Edition. Capture your students’ attention with StudentWorks™ CD-ROM that combines the Interactive Student Edition, the activity workbooks, and the Student Presentation Builder into one easy-to-use tool. 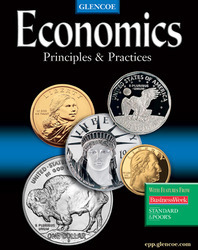 Integrate Internet support with Economics Online Activities, a book-specific Web site (epp.glencoe.com).